I've always thought Kabutops was one of the coolest looking Pokemon. It's head is basically a boogie board/sting ray combo, it's got cool spikes along its backside, and those scythe hands are fantastic. It's also one of the few Pokes that has two-clawed feet; most have three or more. Pretty dang impressive. What's more, my computer auto-corrected the previous sentence to "pretty fang impressive." Seems fitting. Kabutops, like its fellow fossil Omastar, is a Rock/Water type Pokemon, so in addition to its normal weaknesses and resistances, it's 4x weak against Grass, and Fire-type attacks only do a quarter of the damage. I guess das cool, though it's annoying having Fighting and Electric-type moves being supereffective. Oh well. Booty has pretty wonderful Attack and Defense, and its Speed isn't too shabby, either. Special is a bit below average, and HP is the worst of all--a couple Thunderbolts will probably knock Butops out of commission without too much trouble. Movewise, Kabutops randomly learns Absorb, which is a nice little nod to Grass, but the move is far too weak to have any use. And I'm fairly certain that, at Level 46, Kabutops learning Leer is one of the latest times a "beginner move" is learned. Weird. As far as moves you might actually put on your Kabutops, Hydro Pump/Surf should be on there to take advantage of STAB. Pick your poison, whether you want more power or higher accuracy, respectively. 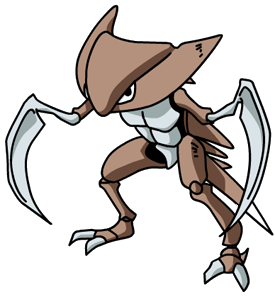 Of course Kabutops doesn't learn a Rock-type move, but it's worth loading it up with physical attacks, a la Double-Edge/Body Slam/Slash/Submission, and capping it off with Swords Dance to uppity that already upped Attack. It's possible to turn Butopiscle into a special-ish sweepe/tank, although I don't recommend it since the Special is nowhere near the Attack level. But you could theoretically outfit Butopslicious with Surf/Blizzard/Double Team and Reflect/Rest. I don't think you'd win a lot of battles that way, I just wanted to let you know it's possible.